"Anything from the minibar?" Even when hotel staff ask this, they're going through the motions. It always seems like the last moment of unecessary service at a hotel to justify high prices for a room. Who raids the mini-bar when they know there's a supermarket around the corner? I always feel over-serviced in hotels. I'm more of the 'dump the bags and head back out' kinda of guest. So I was relieved to discover staff-free internet-bookable hotels in Finland. The first one I stayed at was in Turku. I'd left booking late in the day but to book Omenahotelli you just slip into the nearest internet cafe. I'd seen their perky apple logo around (omena is Finnish for apple) around and wanted to check one out, but as there are no front door staff the only way to do it was to check-in. In the internet cafe it was a swift process of hitting the page and giving credit card details and my mobile number. Within seconds I got sent a text with a room number and door code. Omena are Finland's first to offer this style of business hotel. It makes sense for business travellers who'll swap frills for smaller bills. 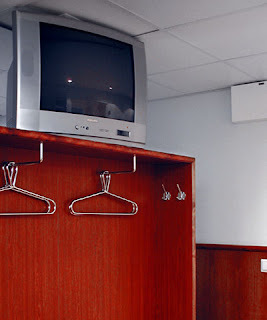 You get the same style of room, but the savings on staff are passed on in the room rates. They plan to expand into Russia and Sweden. It's a smart business model. They've adopted a similar idea at Greenstar in Joensuu. Greenstar has some environmentally conscious design behind it like stacking rooms closer together to reduce heating and smaller lobbies. They have a reception that has limited hours and for the rest of the time there's a small ATM-like check-in machine. At my Omenahotelli it all seemed fairly simple, but there was an older couple milling out the front confused about how to get in. I played the concierge and explained the door code. Once inside it felt like the front desk was missing and you had to find the lift yourself. Again, seemed fairly simple, but the couple were struggling. The rooms are dominated by huge TVs but the floorplan was spacious enough for a small couch. My TV was suspended at the end of the bed and welcomed me by name. There was a remote-control tour through services and a prompt that check-out time was 12 noon. I'd opted for the breakfast option which turned out was around the corner at a local sandwich chain shop. They also had a vending machine on the way in. I don't really like hotel dining rooms anyway. In fact it suited me fine: no fuss and no check-in. The price was cheaper than most hotels but you got the bonuses of hotels like zippy broadband. But when it came to check out something was missing something. Where was the cranky old lady asking if I'd swiped the peanuts or tweny euro bottle of beer? Apart from the disappointment, the only thing I remember about Haruki Murakami's After Dark is the automated, discretion-guaranteed love hotels that become a magnet for discretion-seeking mafiosos. Or am I mistaken? This disappointment is making it all such a blur. No sign of mafiosos in these hotels though they seemed discrete. Worth a read if you're missing him, but not sure it's the stuff of a whole book.